MMMC (Michigan MINI Motoring Club) is a very active MINI enthusiast club that is loosely organized (no membership dues, no officers). Various MINI related events are suggested and organized by interested members. Some events are one-time occurrences, but many end up being so popular they are continued and anticipated yearly, such as The Great Lakes Crossing, Michigan International Speedway touring laps, the Holiday Party and, of course, the Fall Color Blurrr. The Fall Color Blurrr is one of the more popular yearly escapades and is held during the peak leaf viewing season in Michigan. This was the fifth year it was run. It started out as a “Color Tour,” but was renamed “Blurrr” due to some of the members’ enthusiasm for driving the windy Michigan roads…in the case of great roads plus MINIs, driving sometimes trumps sightseeing. The route taken is similar each year, with traditional stopping points, but the road route can vary somewhat depending on road quality and projected traffic. This year the MINIs gathered in the morning of Oct 18th, at a park near Ann Arbor. Once the route was discussed, maps given out and, of course, cars admired, the MINIs, as well as one Miata and a Smart car, headed out in two groups. This Tour is all about enjoying the drive with your friends, but also at your own level of comfort, so the lead group judiciously contained the more “enthusiastic” drivers. The first stop on the Tour was Jenny’s Farm Stand in Dexter for apple cider, warm doughnuts and more of admiring each other’s cars. Thirty seven MINIs were counted at this first stop. 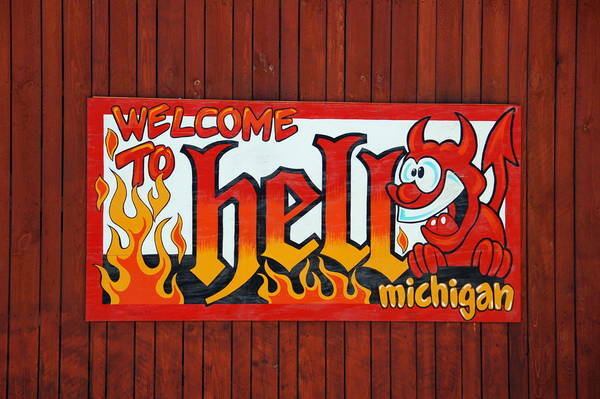 The MINIs then headed out for the most traditional stop of the Tour: Hell, MI. It’s hard to resist stopping at his hamlet when you are in the area because, let’s face it, who doesn’t like to reminisce that they have truly been to Hell and back. Thirty one MINIs were counted in Hell. 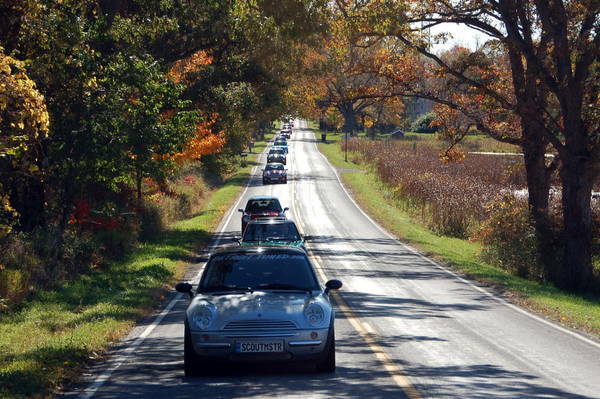 The MINIs continued to motor through the back roads toward Waterloo, enjoying the beautiful Fall colors and drive. There is just no greater feeling than motoring along with a band of like-minded MINIs stretching out on the road in front and behind you. As with many MMMC events some members took the occasional unintentional turn and ended up a bit lost, but thanks to cell phones and walkietalkies they always managed to hook back up. Getting lost with other MINIs sometimes is half the fun. At one point those who were not acutely lost pulled over along a back country road to wait for stragglers to catch up. It must have been quite a sight to see over 25 colorful MINIs suddenly, out of nowhere, lining the road; two young boys paused, dumbstruck by the scene in front of their house. The next stop was Frank’s Mill Pond Deli for a short leg stretch and some more visiting with friends and car ogling. The final destination of the Tour was the Creekside Inn, back in Ann Arbor, where about 40 or so MMMCers settled down for dinner and camaraderie. And so ended another successful Fall Color Blurrr…to Hell (and back). Event Article Merry MINIs on the Mountain Offers Curve-Chasing Fun!